The Sedia Gestatoria and the carrying chair was the local transport of the Pope and heads of state during the 16th century. 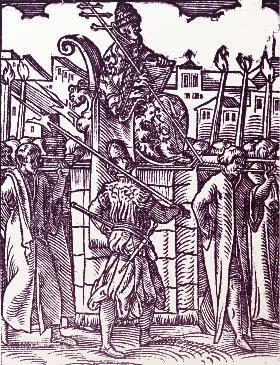 The canopied carrying chair became popular in Naples, Genoa, and the Spanish Court in the last quarter of the 16th century. These forms of transport developed more widely into the fully enclosed (close) or covered chair and man-carried litters during the early 1600s. 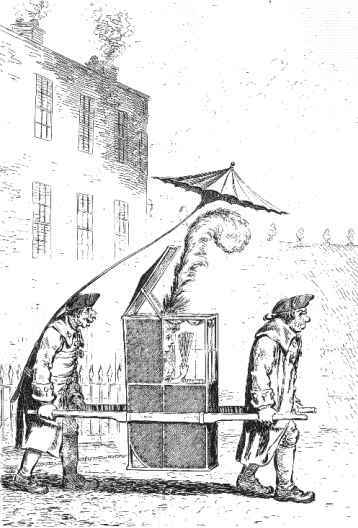 The Sedan, a glass-windowed, cloth-lined enclosed chair or litter was developed in London during the early 1630s. Its name, according to Henry Peacham (1576-1644, author of Coach & Sedan, 1636) derives from the Principality of Sedan on the Meuse, an important centre of cloth manufacture and a Protestant enclave on the North European mainland. The two names ‘sedan’ and ‘chair’ were commonly combined during the first decade of the 18th century and by the late 19th century the combined term came to describe all man-carried transport with a seated occupant. Many European countries extended the use of earlier words to include this new glass-windowed carrying chair. So France used chaise a porteur(s) and Spain silla de manos. In Italy portantina replaced seggiola, whilst in Germany Sänfte described the new chair as well as the mule-litters already in use. In London, the glass-windowed sedans became available for public hire from October 1634 and by the late 18th century more than 2,000 sedan chairs were available to hire in over 37 cities/towns across Great Britain and Ireland. Ornamentation reached its zenith during the period 1745-1775 when there were tens of thousands in private use across Europe. Today probably only 1,600 survive. Learn more by requesting a mailing on the forthcoming publication. Share some of your knowledge in the questions area. 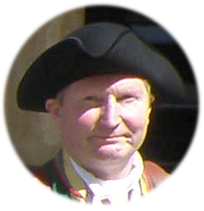 Find out more about your own sedan chair by accessing the research and description service. Share your enthusiasm by arranging a lecture/talk for your friends.